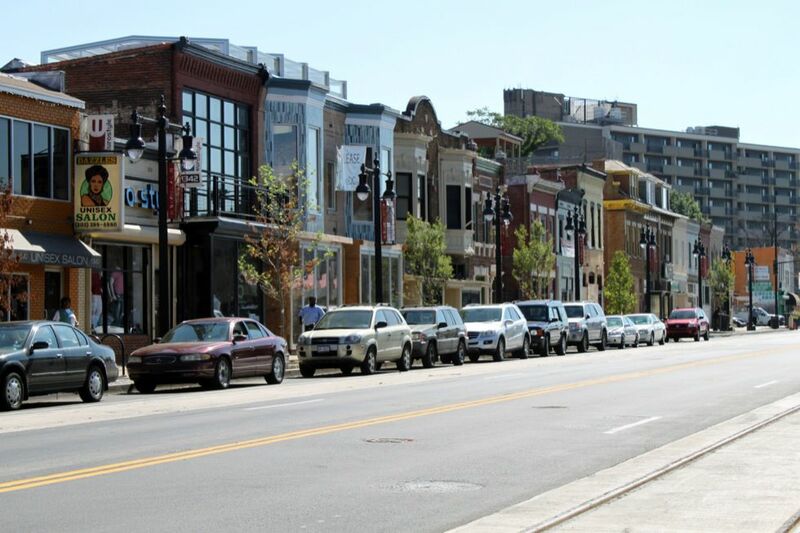 Neighborhood main streets are a nexus of neighborhood life, with high pedestrian volumes, frequent parking turnover, key transit routes, and bicyclists all vying for limited space. 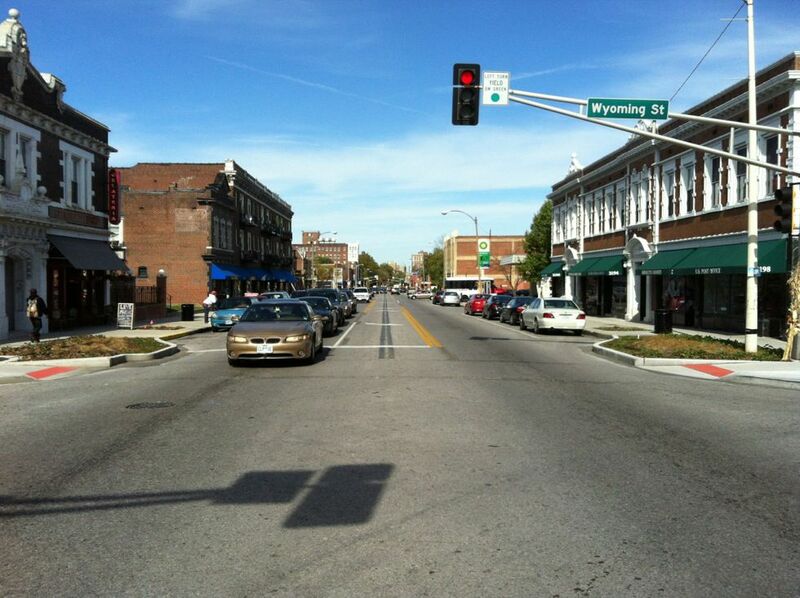 The street illustrated below depicts a 64-foot roadway within a 94-foot right-of-way. 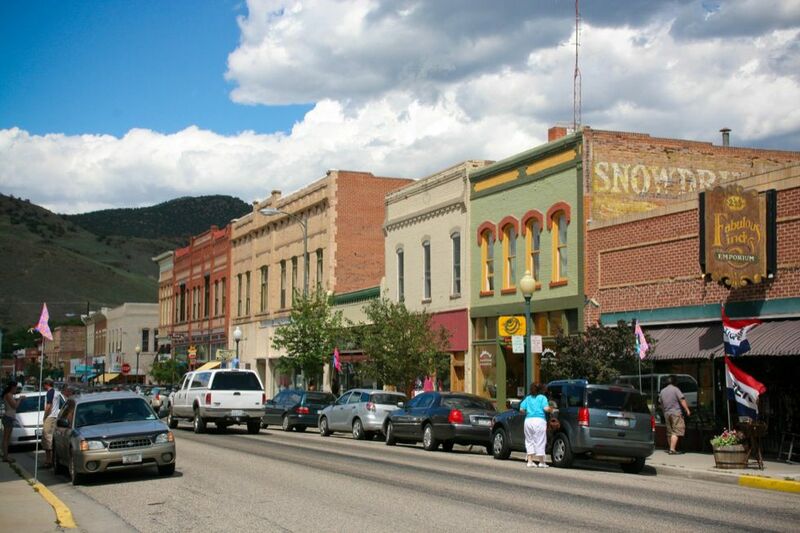 Main street design should limit traffic speeds and create a narrower cross section with frequent, well-designed pedestrian crossings. 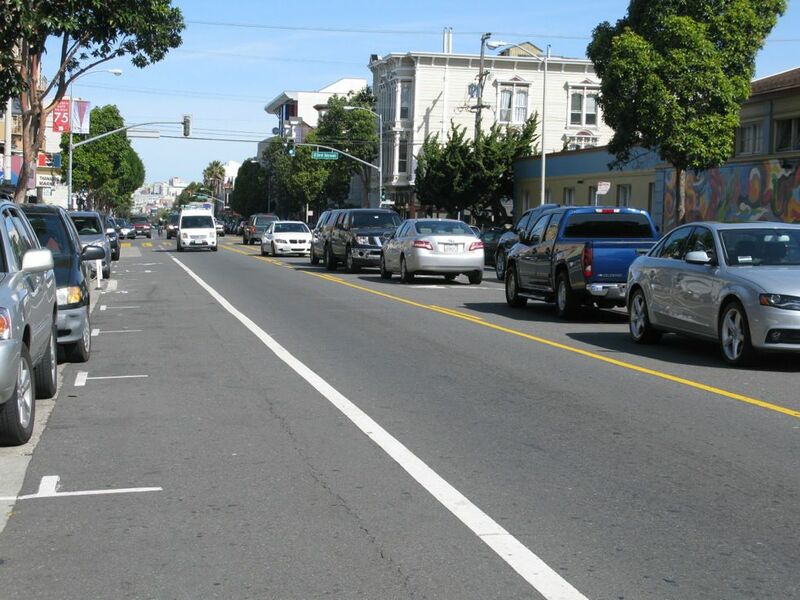 In recent years, many main streets have been significantly improved through road diets and the conversion from 4 to 3 (or 6 to 5) lanes of travel with bike lanes and a center turning lane or median. 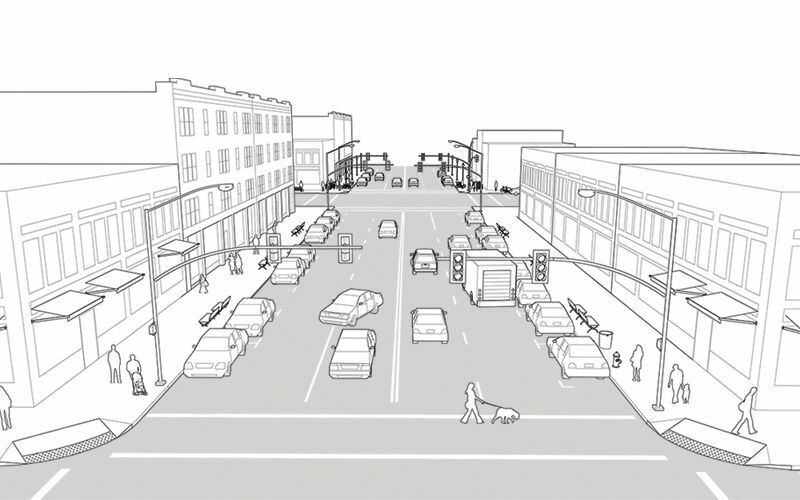 The illustration above depicts a main street with 4 lanes of traffic. 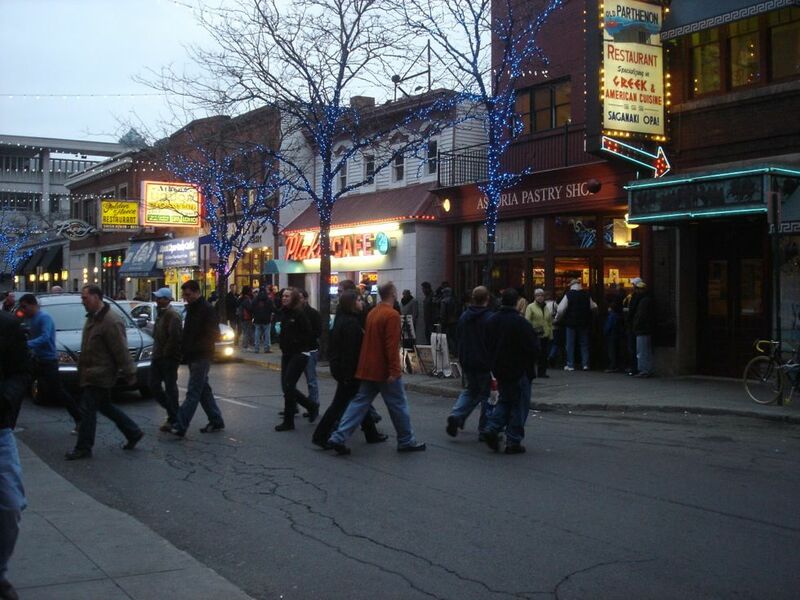 With medium traffic volumes and high pedestrian activity, the street has significant potential for regeneration as a retail district, yet currently underperforms for those who shop, eat, and walk there. Frequent destinations have resulted in multiple turning and weaving conflicts along the street. 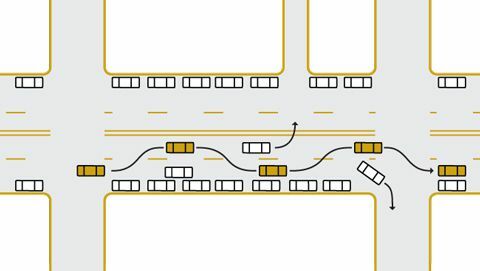 The weaving line in the 4-lane configuration shows the pattern of a driver avoiding double-parked vehicles and drivers turning left and right. In a 3-lane configuration, the weaving and conflicts are eliminated. Implementation of a road diet should consider the availability of parallel routes, the potential for mode shift, and the channelization of traffic using additional signals. 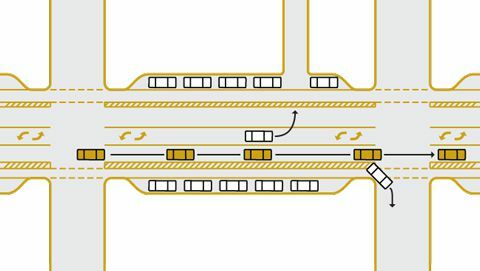 2Turn lanes can help to eliminate weaving conflicts on 4-lane roads. 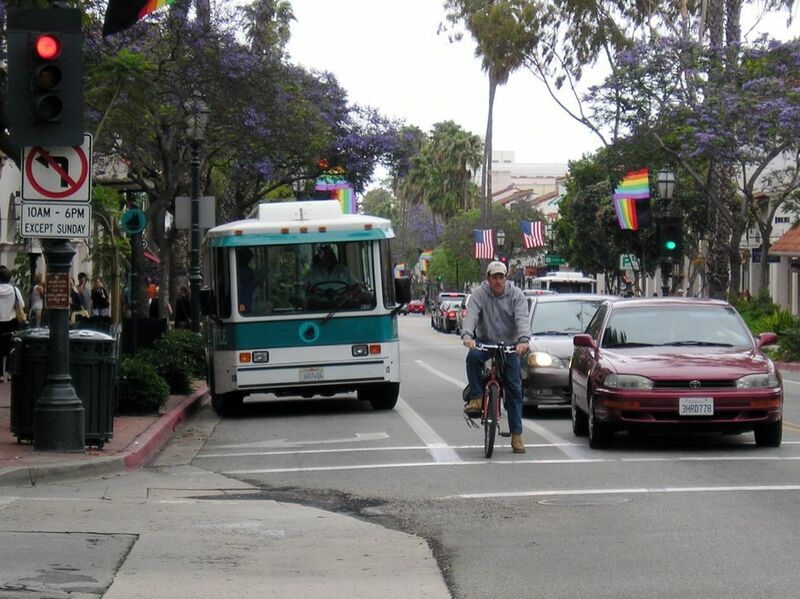 As an alternative to the illustration above, a 6-foot pedestrian safety island can be retained in the above configuration by tapering the bike lane buffer near the intersection and shifting the through lanes to the right. 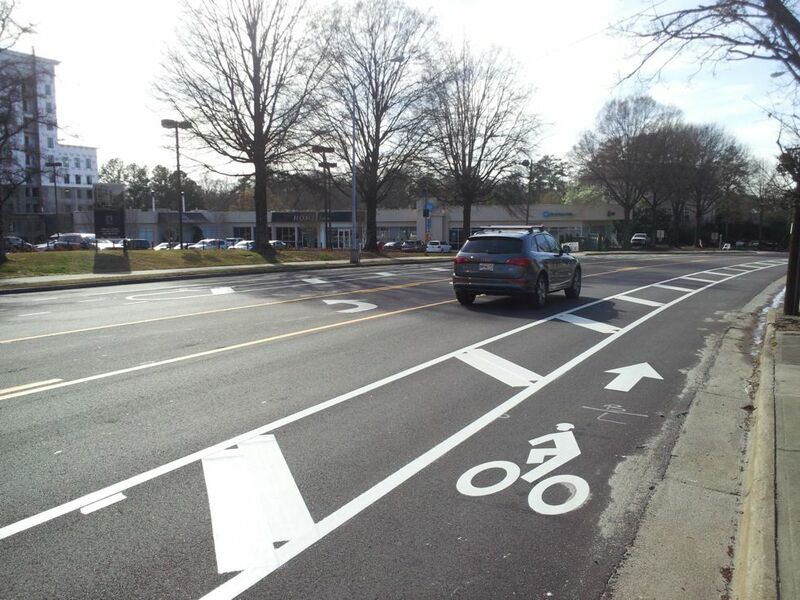 3 The application of a road diet may be carried out in two phases, the first consisting solely of striping and a center turn lane, and the second, of medians and plantings to complement the center lane. 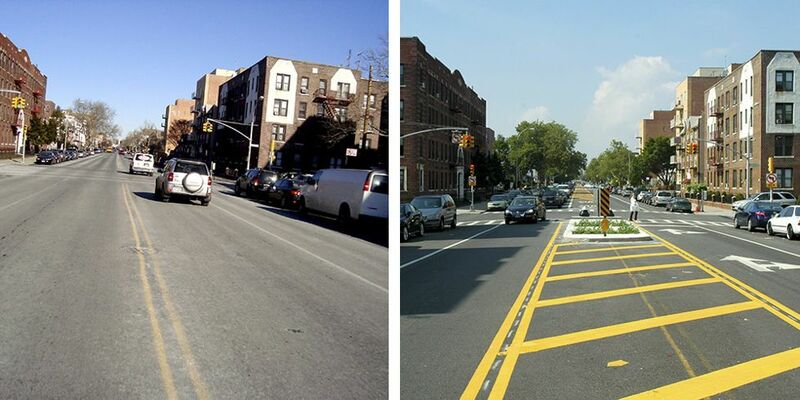 Brooklyn's Vanderbilt Avenue was reconfigured in two stages. An initial redesign was carried out using only striping and buffers. An upgrade added concrete pedestrian safety islands several years later. See York Boulevard: The Economics of a Road Diet (UCLA, 2011) for more information. 5 Bike boxes help cyclists make left or right turns by placing them in front of traffic at a red light. On streets with higher traffic volumes, cyclists may choose to make a two-stage turn. 6 Parklets are ideal for neighborhood main streets with active storefronts, heavy foot traffic, and lots of retail activity. 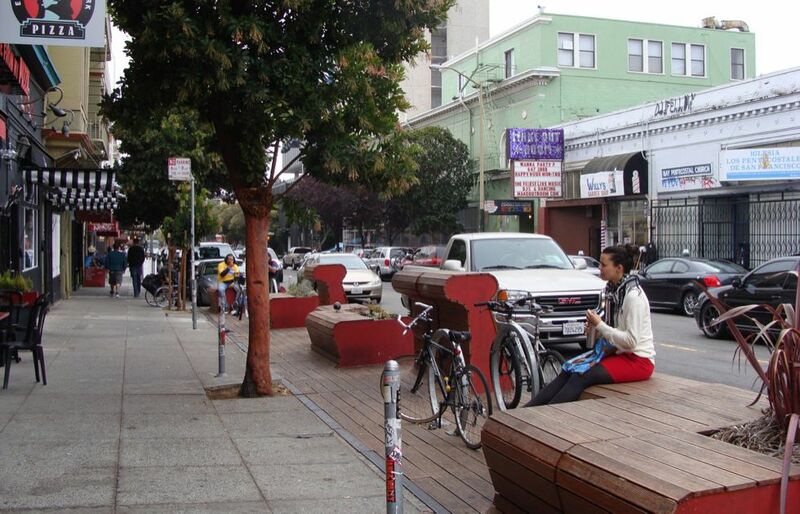 Parklets in San Francisco are often situated on neighborhood streets teeming with commercial and pedestrian activity. 7 Streets with both heavy freight and parking demand, as well as on-street bike lanes, benefit from dedicated loading zones near the intersection. Loading zones help reduce obstruction of the bike lane and make deliveries easier for businesses. Loading zones can be striped and signed, or managed for off-peak deliveries. Evaluation of Lane Reduction ‘Road Diet’ Measures and Their Effects on Crashes and Injuries (Washington, D.C.: Federal Highway Administration, Highway Safety Information System, 2010). Nikiforos Stamatiadis and Adam Kirk, “Guidelines for Road Diet Conversions,” (University of Kentucky, 2012). Dan Burden and Peter Lagerwey, “Road Diets: Fixing the Big Roads,” (Walkable Communities, Inc., 1999). Cullen McCormick, “York Blvd: The Economics of a Road Diet,” (2012). Alan M. Voorhees Transportation Center. “Design of New Jersey’s Main Streets.” Newark: Voorhees Transportation Policy Institute, Edward J. Bloustein School of Planning and Public Policy, Rutgers State University of New Jersey, 2004. Burden, D. Lagerwey, and P. Lagerwey. "P., “Road Diets: Fixing the Big Roads” Walkable Communities Inc., 1999. Ewing, Reid and Michael King. 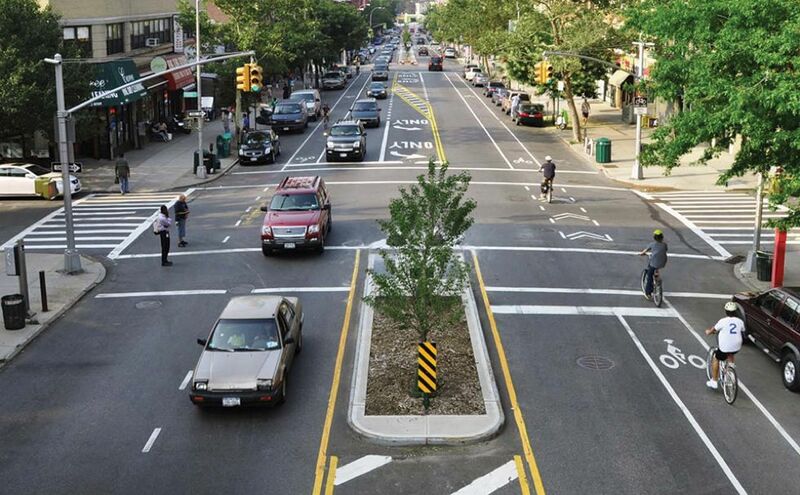 Flexible Design of New Jersey’s Main Streets. New Brunswick: Voorhees Transportation Policy Institute, 1998. Huang, Herman F., J. Richard Stewart, and Charles V. Zegeer. 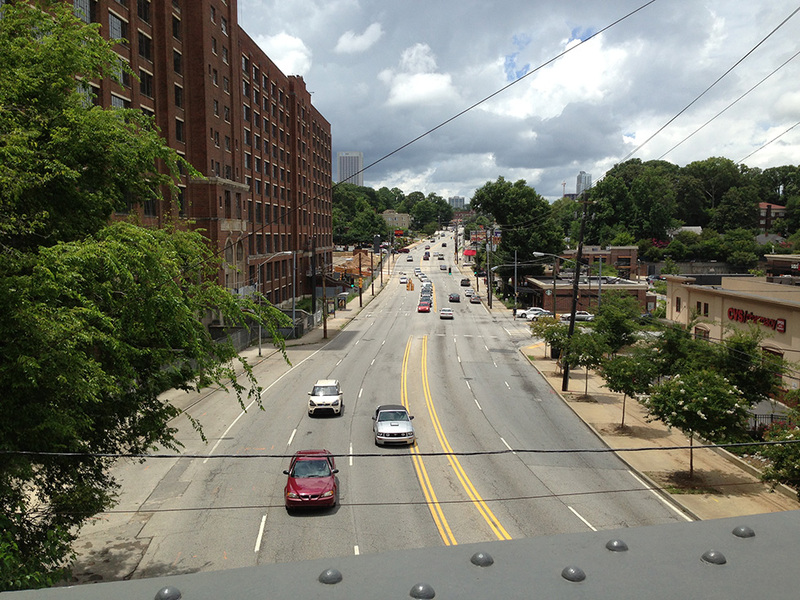 "Evaluation of Lane Reduction" Road Diet" Measures on Crashes and Injuries." Transportation Research Record: Journal of the Transportation Research Board 1784 (2002): (1), 80-90. ITRE. “Transportation Tracks: Going on a Road Diet.” Local Technical Assistance Program, Institute for Transportation Research and Education, North Carolina State University, 2011. Lyles, Richard W., M. Abrar Siddiqui, William C. Taylor, Bilal Z. Malik, Gregory Siviy, and Tyler Haan. “Safety and Operational Analysis of 4-Lane to 3-Lane Conversions (Road Diets) in Michigan.” Lansing, Michigan: Department of Civil and Environmental Engineering, Michigan State University, 2012. McCormick, Cullen. “York Boulevard: The Economics of a Road Diet.” Los Angeles: Luskin School of Public Affairs, University of California, Los Angeles, 2006. Stamatiadis, Nikiforos, Adam Kirk, Chen Wang, Andrea Cull, and Nithin Agarwal. 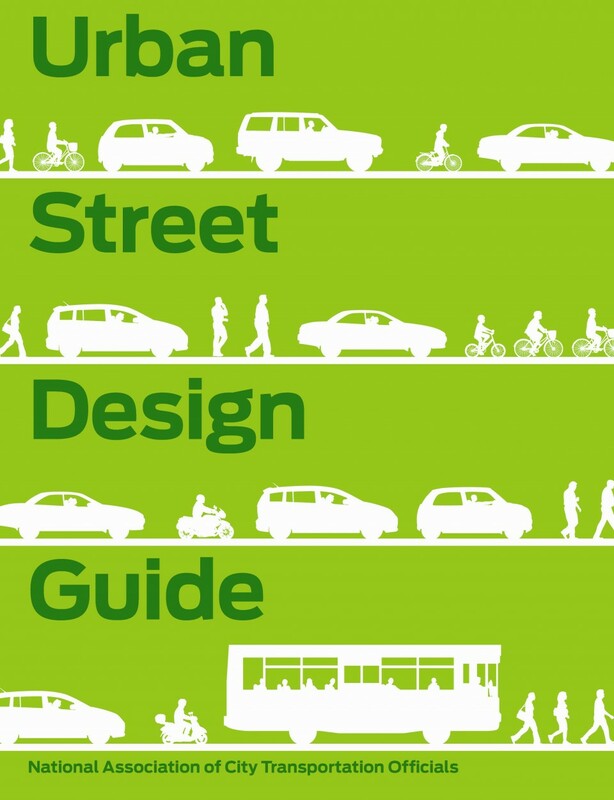 "Guidelines for Road Diet Conversions." Lexington, Kentucky: Kentucky Transportation Center, College of Engineering, University of Kentucky, 2011. Swirsky, Karen, Nils Eddy, David Olsen, Brian Rankin, Dan Burden, and Pat Kliewer. Main Street...when a highway runs through it: A Handbook for Oregon Communities. Portland: Oregon Department of Transportation and Oregon Department of Land Conservation and Development, 1999. Tan, Carol H. “Going on a Road Diet.” Public Roads 75 (2011): 1–11. Welch, Thomas M. “The Conversion of Four Lane Undivided Urban Roadways to Three Lane Facilities.” Prepared for the TRB/ITE Urban Street Symposium, Dallas, June 28-30, 1999. References for Neighborhood Main Street: 9 found. Huang, Herman F, J Richard Stewart, & Charles V Zegeer. 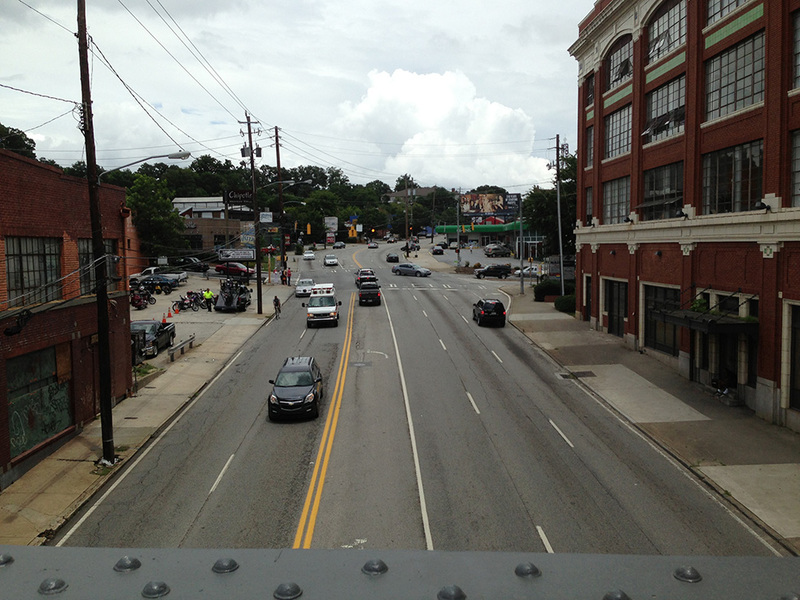 "Evaluation of Lane Reduction" Road Diet" Measures on Crashes and Injuries." Journal of the Transportation Research Board 1784 (1), 80-90, Transportation Research Board, Washington, DC. Ewing, Reid & Michael King. 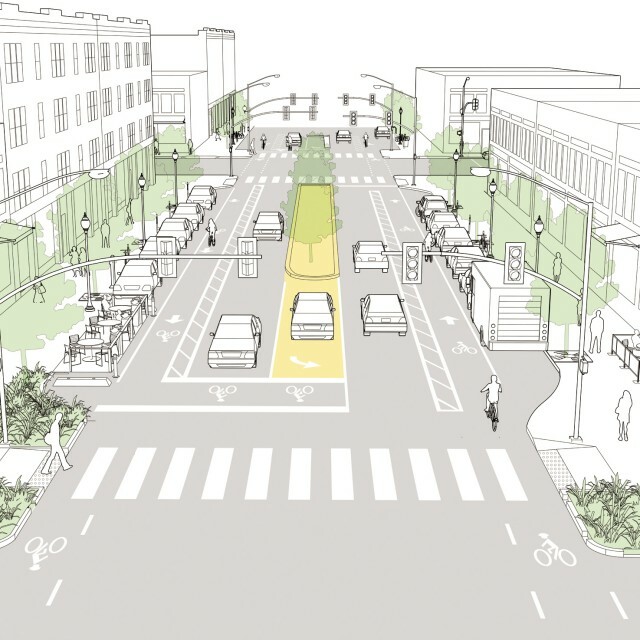 "Flexible Design of New Jersey’s Main Streets." Voorhees Transportation Policy Institute, New Jersey Department of Transportation, New Brunswick, NJ. Tan, Carol H. "Going on a Road Diet." Local Technical Assistance Program, Institute for Transportation Research and Education, North Carolina State University, Raleigh, NC. Stamatiadis, Nikiforos, Adam Kirk, Chen Wang, Andrea Cull, and Nithin Agarwal. 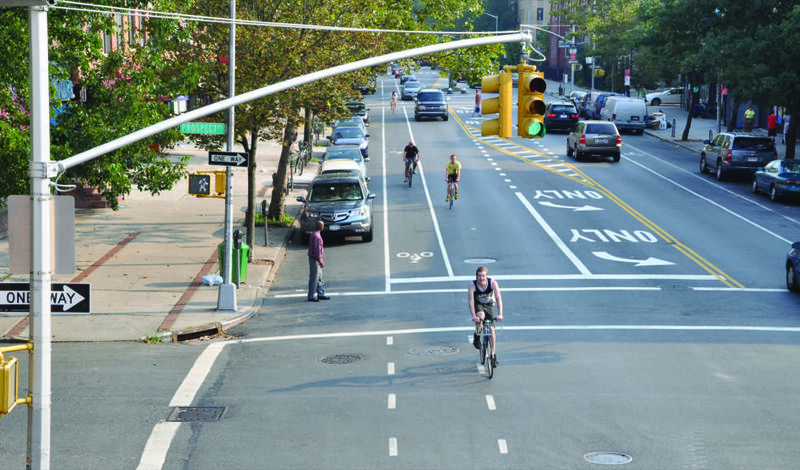 "Guidelines for Road Diet Conversions." Kentucky Transportation Center, College of Engineering, University of Kentucky, Lexington, KY.
Swirsky, Karen, Nils Eddy, David Olsen, Brian Rankin, Dan Burden, & Pat Kliewer. 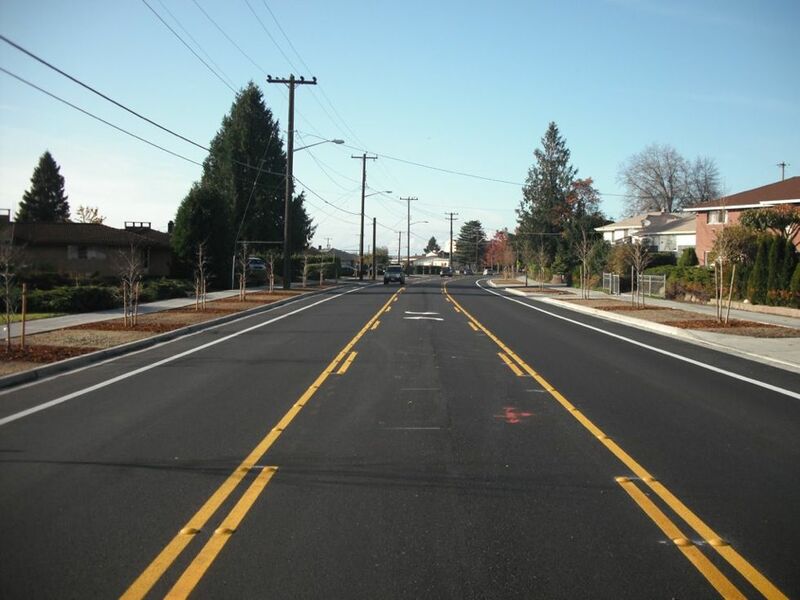 "Main Street...when a highway runs through it: A Handbook for Oregon Communities." Department of Transportation & Department of Land Conservation and Development, State of Oregon, Salem, OR. Burden, Dan, & Peter Lagerwey. "Road Diets: Fixing the Big Roads." Walkable Communities, Inc., Walkable Communities, Inc., Minneapolis, MN. Lyles, Richard W, M Abrar Siddiqui, William C Taylor, Bilal Z Malik, Gregory Siviy, & Tyler Haan. 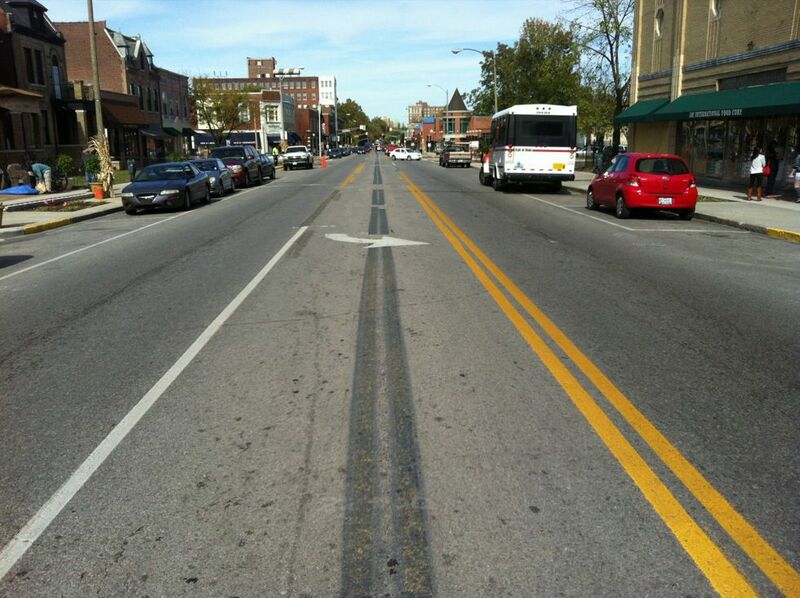 "Safety and Operational Analysis of 4-Lane to 3-Lane Conversions (Road Diets) in Michigan." Department of Civil and Environmental Engineering, Michigan State University, East Lansing, MI. Welch, Thomas M. "The Conversion of Four Lane Undivided Urban Roadways to Three Lane Facilities." Prepared for the TRB/ITE Urban Street Symposium, Transportation Research Board, Dallas, TX. McCormick, Cullen. 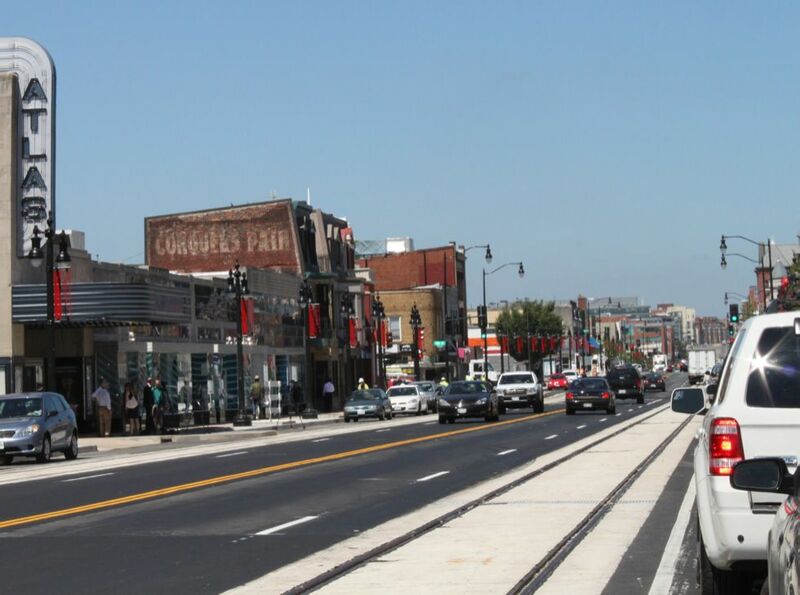 "York Boulevard: The Economics of a Road Diet." Luskin School of Public Affairs, University of California, Los Angeles, CA.